Two portable computers aim to revolutionize education and access to technology across the world. As they begin pre-sales, here’s a look at their rocky roads to reality. The makers of two high-profile new devices, India’s Aakash tablet and Raspberry Pi Foundation’s Model B both chose the same target price for their low-cost creations, and set out to change education with innovative technology. But while the two devices share some fundamental similarities, each has a future that is looking dazzlingly different. Raspberry Pi Foundation officially registered. IIT J’s Prem Kumar Kalra and team begin building a low-cost prototype in earnest. DataWind opens pre-orders for Aakash and picks up 1.4 million pre-orders in two weeks. Raspberry Pi Model B early models hit eBay, sell for thousands, while commercial models go into production. Differences of opinion between IIT J and DataWind surface. “These are minimum standards which they cannot accept,” Kalra tells Fast Company. Kapil Sibal announces that they have had problems with DataWind, but that they can still bid to manufacture version 2.0. Ten thousand units of Raspberry Pi Model B go on sale and sell out in a matter of hours. Unnamed sources tell the Indian Express say IIT J will no longer be involved with the Aakash project, but responsibility will be moved to another campus. Aakash is a low-cost tablet, and Raspberry Pi Model B is an ultra-cheap, customizable computer. Both tech innovations have education and economy as their central goals. Both have big potential, too. Aakash could fundamentally change the way Indian students and most of rural India connects with the Internet. The Raspberry Pi, directed at budding computer engineers in (for a start) the U.K., could alter the way the next generation thinks about coding and building in the computer universe. Early demand for both devices has been strong. The Raspberry Pi Model B launched Wednesday, sold out, and crashed suppliers’ websites. When a version of the Aakash went on sale, it met with an equally cheerful response (complete with website crashes), hitting 1.4 million preorders in two weeks. Aakash was first out the door, with version 1.0 launching at a generously publicized high-profile event last year. But while future versions wait in the wings, developments over the past few weeks has brought progress for Aakash 1 to a grinding halt. Manufacturing is stalled as the tablet makers (Canadian/U.K. company DataWind) and designers (IIT Jodhpur) disagreed over the tablet’s minimum requirements and price. Also, the government body overseeing the project (India’s Ministry for Human Resource Development), who’ve cultivated a reputation for themselves as serial squashers of budding technologies, reassigned roles and responsibilities and recently decided to find a new manufacturer for the next round of tablets. While the government dawdles on, competition for a low cost educational tablet for India has caught up. Indian Telecom giant BSNL just announced three low-price tablets, starting at $70. 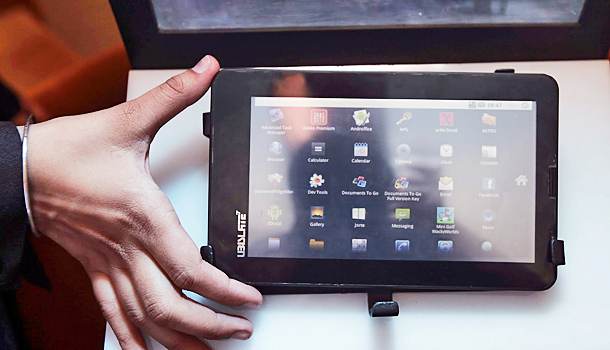 They’re not alone–AcrossWorld Education, partnering up with Delhi company Go Tech will start selling the A-Tab, an Android tablet, to schools and colleges in March. Meanwhile, the initial government order for the 100,000 Aakash tablets from DataWind remains unfilled (only 10,000 have shipped). But the tablet may see brighter times outside India–Angolan telecom provider Movicel has signed a purchase order for 100,000 3G customized 7-inchers. Raspberry Pi’s target market is also a little different. First in line to buy the Model B will likely be hobbyists and DIY tech enthusiasts, who’ll want to rig up the bare-bones device to perhaps play music or maybe stream TV. The Pi foundation hopes it will stretch to include school kids, who will be swayed by the simplicity of the computing platform and its inherent customizability (you even have to bring your own keyboard) and approach computer science and coding as swashbucklers. Proceeds from the sales of the Model B will go back to the foundation, to do more outreach for computer science education, something that’s seen promise in early tests with live 12-year olds. Eben Upton and his team at Project Pi have figured out how to keep their goals in sight while solving the problem of price and scale. Their licensing agreement, the BBC observes, helps them funnel back proceeds from the sale of the device into educational outreach, and their status as a non-profit has encouraged donations and contributions that has gotten the project off the ground. The ability, freedom, or prescience to set things up similarly has so far eluded the Aakash team.